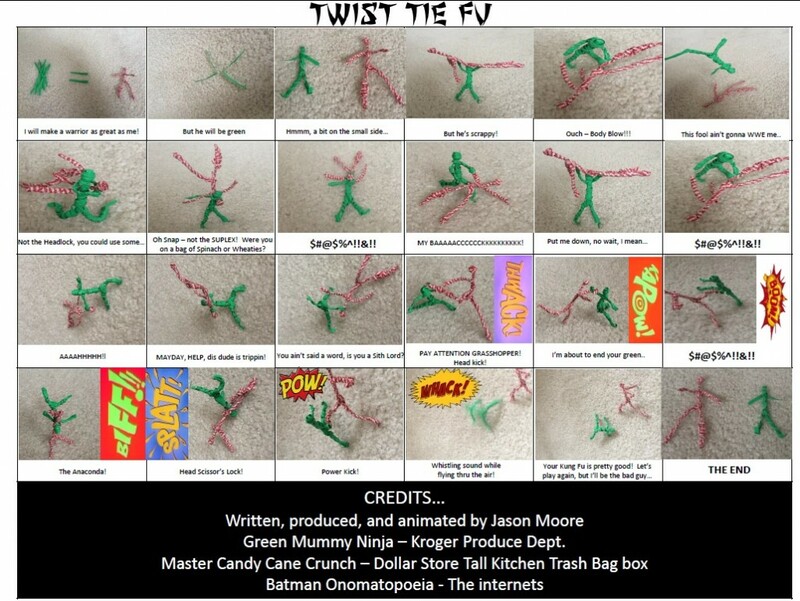 Make free action figures from twist ties! 1. Get 10-20 twist ties from your local grocery store’s produce department or from a box of plastic trash bags. 3. Fold a third twist tie in half and twist it off to make a head and neck. 4. Add more twist ties to give your character “body armor”. 5. Give your action figure a cool name: Green Mummy Ninja, Master Candy Cane Crunch, Twist McFist, Hefty-Hefty-Hefty, PaperWire (Mercenary for hire), (APCWN) A Pipe Cleaners Worst Nightmare, or come up with your own. 6. Make a second Twist Tie Toy following steps 1-5.